By Air Chief Marshal Jamal A. Khan One of the PAF’s most courageous leaders, Air Commodore M. Zafar Masud, HJ, SBt, breathed his last on Oct 7. In 1953, my first posting after operational training was to a jet fighter squadron at Faisal air base, Karachi, which was commanded by the legendary F. S. Hussain. 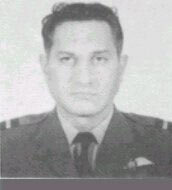 The squadron commander’s fatherly figure was balanced by Flight Lieutenant Mitty Masud, our tough, uncompromising second-in-command. Masud led us through the hazards of combat flying with the same energy and disregard for danger as he showed in his spirited embrace of Karachi’s social milieu. Ever visible was the infectious idealism – the reason for his nickname, an allusion to the fictional Walter Mitty – that drove him to set for himself and his subordinates difficult-to-achieve standards. Air Commodore Masud was very happily married to his devoted wife, Elizabeth, for 45 years and their son Salaar works as a software analyst in Europe. Elizabeth Masud, a German lady, speaks Urdu fluently and has, despite her own frail health, lovingly remained by her husband’s side, including his long and difficult battle with Parkinson’s disease. As a PAF commander’s wife, she was a leading member of the PAF Women’s Association and made strong contributions to the families’ welfare schemes. She was especially supportive of her husband’s particular attention to the living conditions of the lower paid employees. Many still remember fondly her energy and enthusiasm in projects dealing with child care and pre-school education at the PAF bases at which Masud served in various capacities.